Brandon Boykin is one of three things: stupid, bitter, or irresponsible. Hey, who am I to judge? We all have our flaws, right? Just because Brandon Boykin may be an idiot doesn’t make him a bad person. Alternatively, in the same breath, just because he’s bad person, that doesn’t make him an idiot. If he’s neither, then he’s just careless. I truly hope, for his sake, that it’s the third possibility. Brandon Boykin was traded by the Eagles to the Steelers for a 5th round pick. Inevitably, like clockwork, out came the accusations of racism. Boykin did not shoot them down when offered, instead saying that Chip Kelly has issues with “Grown men of our culture.” Of course, he quickly backed down and swore up and down he doesn’t believe Kelly is a racist. That’s a very amateur way to cover yourself when you know what you’ve said was dumb: say one thing then immediately say something completely opposite. So what’s the problem, then? A grown man stated his opinion, then backed off of it? Who cares, right? Everyone, apparently. And this is the problem. All over ESPN, the first thing on sports talk radio, Sportscenter, PTI, ATH: The Eagles and Chip Kelly’s racist image. You can’t make an inflammatory statement then pretend there was nothing to it no more than you can shout fire in a crowded theater and be surprised when there’s mass panic for the exits. This is why I have to make one of the above three determinations. There’s no other explanation for making a vapid statement like that. First of all, it’s incredibly stupid to make any judgements about someone like Chip Kelly in that vein. 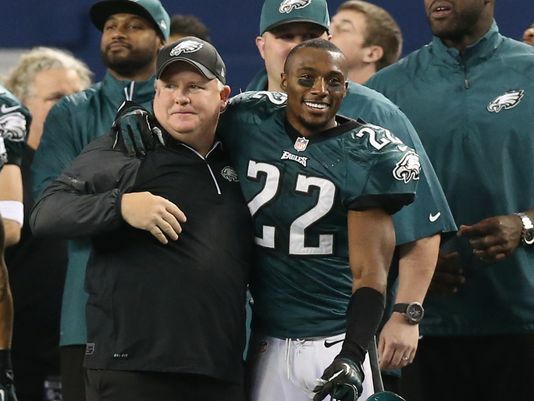 Chip Kelly cuts you because he’s uncomfortable around men of your culture, Brandon Boykin? I’m sorry, but who did he bring in at your position that made you expendable? Eric Rowe, Brandon Browner, and Walter Thurmond. What do all these gentlemen have in common? All young African-American Males. To make that statement is to insinuate those three aren’t of your culture. Perhaps Brandon Boykin was bitter he wasn’t given a fair shot? This is the most understandable. He had a good run at the nickel spot and was never given a legitimate chance at starting on the outside. But to say it’s because Chip is uncomfortable with you “culture?” Come on, now. Chip was such more likely to be uncomfortable that you were about as tall as Mugsey Bogues and couldn’t make it on the field ahead of the worst starting corner combo in the NFL. If Boykin REALLY killed it in practice, he would have started ahead of Cary Williams and Bradley Fletcher. The bitter card has been played by several former Eagles in relation to Chip Kelly, though. One of the first people to call out Chip Kelly was Tra Thomas. Arguably one of the greatest Eagles players of all time, no one can doubt what Tra/William did on the field. Chip even gave him his coaching start in the NFL. But when his contract wasn’t renewed, Thomas followed the lead of noted race-baiter Stephen A Smith and stated there was a “hint of racism” in the Eagles locker room. Has anyone taken notice that Tra Thomas hasn’t gotten another coaching gig since being fired by the Eagles? There are plenty of “non racist” coaches out there who would love to hire him if he was a competent coach, right? The bitterness is exemplified in LeSean McCoy and DeSean Jackson. No one can doubt Shady was an thoroughly outstanding running back. and DeSean was an absolutely electrifying WR and PR. But both of their comments after being let go were thoroughly undeserved. McCoy was outrageously blunt: Chip wanted to get rid of all the “good black players.” It’s an unbelievably ignorant statement. Chip replaced him with the NFL rushing champion, Demarco Murray, a black man, and Shady had the unmitigated gall to say something like this? Are Jason Peters, Fletcher Cox and Malcom Jenkins not “Good Black Players”? LeSean was incredibly out of line saying something like that. DeSean Jackson, too, has spent quite a bit of time and energy trashing Chip Kelly in ESPN the Magazine and his TV show that nobody knows exists. For his sake, he’d better hope it’s just being irresponsible, just mouthing off without thinking of the consequences. What does he really mean by “men of our culture?” What does that say about Chip’s favorite players, young men like Jordan Matthews, a black man who is the first to show up to practice and the last to leave, who works harder than anyone and doesn’t stay out partying all night? Or Kiko Alonso and Mark Sanchez, two hispanic-Americans who have been first in line to defend Kelly? Or DeMeco Ryans, Cedric Thornton, Darren Sproles, and Brandon Graham, all African-Americans who work hard and would run through a wall for Chip? What are LeSean and Boykin really saying about those players? Have they not noticed Chip is just systematically getting rid of former Andy Reid players, white as well as black, like Todd Herremans, Jason Kelce and Nick Foles? Why does there have to be some sinister undertones? Why can’t it just be you weren’t good enough, or Chip wanted to go with someone taller or a straight line runner? More importantly, why do I care? This is a frivolous piece of fluff invented by the 24-hour sports news cycle to fill up time not already taken up by Deflategate. Any rational person can see how goofy this entire “saga” is. I care because this is supposed to be football season. I want to rip on Chip Kelly for the abysmal Riley Cooper contract because Cooper underperformed last season, not because I think Chip has some evil ulterior racist motives. I want to turn on sports TV when I get home from a crappy day at work, and listen to them go over whether their new #1 corner Byron Maxwell can step up, not whether their former #3 is frustrated he got traded. Nothing annoys me more than to hear commentators and social media morons who don’t pay more than 10 seconds of attention to this team outside of Sundays in the fall babble on about how he must “address” this situation, and that the diabolical, racist Chip Kelly bogeyman is out to get every young black player. It’s embarrassing, quite frankly. This shouldn’t have to be addressed, no more than talking about the Illuminati and the fake moon landing. God help me, I’d almost rather- and this hurts to type- hear people talk about Tim Tebow. Almost.